In the Sengoku period of Japan, a young orphan named Kotarou and his dog Tobimaru steal from unsuspecting villagers in order to make ends meet. However, Kotarou is forced to remain on the run when he finds himself being hunted down by assassins sent by China's Ming Dynasty for mysterious reasons not involving his petty crimes. Fortunately, the duo run into Nanashi, a ronin who has taken refuge in a small temple, when Kotarou is attacked and Tobimaru poisoned. Although the samurai saves the helpless pair from their pursuers, he feels that there is no need to help them further; but when offered a gem in exchange for his services as a bodyguard, he reluctantly accepts Kotarou's offer of employment—just until Tobimaru is healed and the two reach their destination. As the three set out on a perilous journey, it soon becomes evident that their path is riddled with danger, as the Ming Dynasty has now sent a terrifying swordsman after them to capture Kotarou and fulfill a certain prophecy. Stranger: Mukou Hadan won the award for Best Animated Feature at Brazil's International Fantastic Film Festival and was nominated for the same categories at the Asia Pacific Screen Awards and 81st Academy Awards. It also won the 2009 "Menzione Speciale" recognition at Italy's Future Film Festival. Sword of the Stranger is both unusual and refreshing in the way that it seemed to come out of nowhere and prove to be a remarkable anime. It seems, lately, that anything warranting a large budget and a lot of effort from a studio is either a sequel, an adaptation based on a successful manga or novel, or the next dull addition to a creatively stagnant franchise. None of these things, Sword of the Stranger is an unexpected big-budget film, which leapt instantly to the forefront of my favoured anime movies with exhilarating action sequences, captivating visuals, raw, evocative music and simple but affective characterisation. The look and sound of the show will instantly grab you, and perhaps even carries the film over the insubstantial plot backbone. Some people have already ordained this film as a classic of sorts, but I&rsquo;d have to disagree with that, simply because, although it hits hard and fast with splendour, and resonates beyond mere eye-candy, it doesn&rsquo;t have a crucial element to elevate it into that tier. The characters do have sufficient weight for the audience to empathise with them, and they are also very likeable, but I felt that my appreciation of the characterisation is due largely to the voice talent behind them. So, credit goes to the cast and not necessarily to the way the film was written, which perhaps had more featured characters than it should have. If the film had focused more on the central to characters, I feel it could have been a classic, or at the very least, deliver an even more powerful finale. Perhaps replacing some of the action scenes with more intimate, personal character moments could have helped. But that minor gripe aside, the big problem with the film was the gaping hole where the plot should be. A plot should always be more than just a vague framework to drive a movie from one scene another all the way to the climax. It should give credence to the movie, so that the film has a certain importance or reason. As it was, the plot, both simple and relatively silly, told me that the film existed for the sake of great action scenes. It&rsquo;s a valid premise for entertainment, but it means there&rsquo;s no lasting impact on the audience because it doesn&rsquo;t really have anything much to convey. There&rsquo;s no story here I haven&rsquo;t seen before in this genre, and for much of the time the plot is a little too confusing. It seems I&rsquo;d almost forgotten the potential for animation to be so visually compelling. On a technical level, the anime medium has frequent success, but transcending animation quality, it&rsquo;s a very rare experience for an anime to be truly visually compelling, creating not just mood and detail, but also scenes of beauty. This film achieves that in a way that totally blew me away, and I don&rsquo;t say that very often (I&rsquo;m not one of those apt to calling every Kyoto Animation production flawlessly animated). The climax of the film, a roaring skirmish amidst snow and fire, is breathtaking and elegiac. More than just an impressive, visceral action sequence, it is tinged with emotion and dramatic tension, which drives the film up to its climactic pinnacle. As I say time and time again, the concept of a conclusion is highly important to me. When anything ends I expect more than a bit of excitement, or an explanatory wrap-up, I want the climax to resonate and to pay-off the themes of the series/movie. This film does achieve that, and even though it is devoid of really challenging and engaging themes, it still manages to be moving with likeable characters and endearing score music. In my mind, an anime that can end on a powerful high note, with stunning production and consistent pacing, is a winner. Even though the film falls prey to a number of action film clich&eacute;s, and at times feels like a rehash of bits of the samurai film genre, and even though its plot is undemanding and almost silly, it is irresistibly engaging. Beyond anything else, this should definitely be approached as an action film, and with that approach, I can safely say it is a great accomplishment in its genre. It is fast-paced and features fierce, clever battle sequences, but more importantly, overshadowing the violence (which any action film can claim on), it is rendered with artistry and beauty, and effortlessly tugs at your heart. Frankly put, the only flaw in this film is the slight lack of depth to the characters, and the completely unremarkable plot. But if, like me, you&rsquo;ve grown tired of the relative mediocrity of most anime television and want something to renew your love for the anime medium as an art form, this would be a good bet. Wow. This movie has left me nearly speechless. There are scenes in it that are shocking, jaw-dropping, amazing...if you haven't seen this movie yet, and you like action movies, with a good plot, solid characters, and the best action sequences I've ever seen in an anime, then beg, borrow, stea---er, do whatever you can to get your hands on it. You won't regret it. Take my word for it. I guess I could just say that and be done, but if you're not convinced yet, I'll pimp it some more. Story - typical action stuff, set in historical Japan, but has twists enough in the plot to make me unable to predict exactly what was going to happen next--and I've watched enough action movies and anime to know that this one stands firmly within its chosen genre, yet breaks out of it from time to time. This, I think, makes it interesting to watch (because who wants to be able to predict the whole story?). Art - Quite good, detailed backgrounds, though there aren't that many grand, sweeping vistas in this movie. There's some CG that's done fairly well. The action scenes is where the animation makes you sit up and question whether what you've just seen is drawn or not. I've never seen sword fights done this well before: without excessive slow-motion, artsy camera angles, just straight up, flat out, swordsmanship. Of course, it's flashy, but much more realistic than many live action sword fights I've seen in other movies. The characters are drawn realistically as well. Sound -There were distinctly Japanese themes and instruments in the soundtrack. Perhaps a bit over-dramatic at times, but I like dramatic music to set the scene, so though it may bother some people I liked it a lot. Character -Some cliche/stereotypical stuff here, but for the most part, sympathetic characters. There's no annoying characters, and the main characters are developed/change throughout the course of the movie, which in my opinion is hard to do considering the time constraints. Enjoyment -Well, if you don't like a lot of blood, then your enjoyment will be lower than mine. I don't particularly like loads of it, but in this movie, since the fight scenes are realistic, with swords and all, there's all the slicing and dicing of enemies you can possibly imagine that goes on. Ok, enough of my raving about it. Just go watch it already!! When I decided to watch Sword of the Stranger my expectations were set pretty high and after watching the movie I can gladly say that they were completely fulfilled. I expected good story set in interesting period of Japanese history and great productions values that studio Bones are known for, all of this were there and even more. I was always interested in asian culture and history, it fascinated me as a huge history nerd. It was something different from the European culture that I grew to know and I became interested in Japan's history and culture particularly when I started watching anime. Sword of the Stranger is set in Sengoku Shogunate period when Japan was greatly divided in lesser clans who constantly declared wars on each other to gain more power. The story's setting is wonderfully presented and characters that that range from Japanese Samurai Warriors to foreigners from China suit it very well. Despite some light mystery plot devices conflicts in the movie feel realistic and in place in this period of cruel politics and war making. Sword of the Stranger is a story of a boy, a hound and a former Samurai getting to know each other as they are chased by mysterious warriors from China and Japanese government. The Story is mostly about bright themes such as trust and friendship but there are also some darker undertones such as greed for power and egoistic desires. When the story itself isn't especially original it is definitely very well presented. There is always something interesting going on and amazingly EPIC fight scenes thrown in to keep viewers entertain. Only sometimes it may feel that the movie is constantly slowing down to get from the one great part to another. The final climax definitely deserves mentioning, it is everything that action flick's final climax should be. Without spoiling much I can say that there's some awesome battle. Sword of the Stranger is a type of movie that rewards you if you pay attention to the details, there are many things that are easily missed but matters to the plot. If your eyes did not caught everything, you can just rewatch the movie, it is really worth it. Let us start with one of things that make Sword of the Stranger one of my favorite anime films. Fights. Such words as EPIC are heavily overused on the internet but there is no better way of describing fight scenes in this movie. You can't call them very realistic but they still manage to suit medieval Japan's setting well enough to maintain the climate. Animations are extremely fluid and movements have real weigh to them. The facial expressions are also amazingly well done. Backgrounds are well done, in fact I would give 9 or 10 to this movie for animation if it would be aired this year and not almost seven years ago. I found movies soundtrack very emotional, actually I think that music contributes a lot to the feel of a whole movie. Both the amazingly animated fights scenes and what comes between would not have the same impact without this wonderful soundtrack. I did not found anything wrong with voice acting. The only "problem" that I had was the chinese voice acting. Honestly I can't tell if it's bad voice acting or just chinese doesn't sound that good to me. 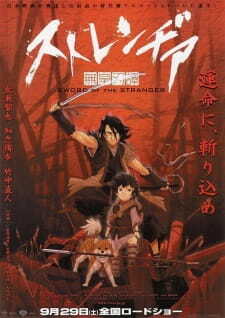 For a two hours long movie Sword of the Strangers characters are well developed. There are few characters that goals are explained, there are some greedy characters, good guys or just common folk that just care for the weather and market prices. With good diversity and development of the main cast we already have a group of maybe not completely original but interesting characters. The way different characters behave is fairly realistic and suit Japans Sengoku period and historical accuracy is always a nice touch to any series. I really liked excellent sword play that this film have to offer and realistic medieval Japan's setting. Story wasn't very original but definitely enjoyable one. Final climax was also excellent and show rewarded my attention to details. Overall extremely enjoyable movie. Sword of the Stranger is definitely fine piece of art and I can easily recommend it to anyone. Even if your not a fan of Japanese culture you definitely find this movie enjoyable, thanks to its extremely high production values and simple story that everybody can enjoy, more or less. Stranger is first and foremost an action movie. Because the meat and potatoes don’t lie primarily with the plot, its straightforward and very typical “unlikely hero” premise is forgivable. A wandering swordsman reluctantly agrees to protect a child from an elite Chinese expedition. The local feudal lord joins the pursuit, stacking the odds further against the protagonists. By no means am I implying that the story is bland. The web of tangled motives creates conflicts between the feudal government and the Chinese, and also internal conflicts within each group. There’s plenty of plot movement here to justify a feature length film even though the simple premise of “samurai protects child” remains throughout. The overall simplicity is, in fact, a benefit to this historical martial arts epic; the story flows at a brisk pace, but remains cohesive and effortless to follow. This straightforward approach to the plot lends itself to the primal, action oriented appeal of this film. In the bread and butter aspects of the visuals, Stranger isn’t especially impressive for a movie. Though the character animations show consistent attention to details of weight and balance, the ugly CG and the lack of textural details in the background make the more mundane scenes easily mistaken for a half decent TV series. As soon as the first action scene shows up-and fret not, for this occurs during the opening credits, the merits in the visuals suddenly become abundantly clear. Aesthetically, these scenes are impressive. The characters are spritely and acrobatic, but grounded with a touch of realism in their body mechanics. Even in the fastest exchanges, the frames of animation are sufficient to keep individual moves distinguishable. Regarding everything that puts the drama into gratifying action scenes, Stranger delivers in spades. The action choreography moves at lightning speed with elaborate exchanges passing within the blink of an eye, but apart from a few of the villains’ excessively acrobatic flourishes, the characters’ techniques still manage to stay within their weapons and personalities. The main character, for instance, is an unambitious, get the job done kind of guy, which comes through in the action scenes with his simple, fundamentally sound usage of his two handed sword. The fact that he actually cuts and thrusts with two hands may seem like a trifle detail, but it contributes to the continuity of his character. Considering the characters’ personalities in the choreography make it altogether more believable, more engrossing, than if it had been treated merely as eye candy. This film puts the “acting” of the characters to good, tension building use as well. With their body language and facial expressions, most of the characters show fear as they barely manage to thwart an attack and an eruption of killer intent as they deal a finishing blow. A few of the villains are emotionally unphased by pain, which, by design or not (in this case, it is by the design of the plot), saps a little of the drama out of these scenes. Still, a good majority of the cast members, including the main character, deliver convincing performances that make these fight scenes more like a tooth and nail brawl, and less like a ballet masquerading as violence. The music primarily consists of the powerful orchestral pieces typical of epics. The ever present leather drum beats and flute solos give the soundtrack a distinct Asian flavor appropriate for the setting. The full onslaught of an orchestra of strings or a blaring leather drum beat are played against the action scenes, while unaccompanied flute solos match well with the more tender segments. Despite the range of emotions that the different tracks embody, the Asian motif keeps the soundtrack cohesive, as if each track was part of a single, larger piece of music. My one glaring issue is the “dub” put over the Chinese expedition. It’s shown many times in the movie that these characters don’t speak Japanese with any semblance of fluency. Most of the time, their lines will be dubbed in Japanese, leaving the viewer to imagine that in reality, the language they are speaking is Chinese. On the other hand, at seemingly random points, these characters will actually speak Chinese to each other. How the director decided when Chinese was appropriate as opposed to the dub is beyond me. One character may deliver a Chinese line, and the very next line he utters in the same scene will be dubbed. It’s also a little jarring when half of the expedition speaks perfect Chinese while the other half speak it so poorly that had the context not been there, I’d have sooner guessed it to be broken German than broken Chinese. The characters in Stranger have few nuances. Simply describing the two main characters as lone wolves, one a petulant child, the other a reluctant, carefree ronin, covers most of the complexities you will see in their personalities. From this description you could probably also guess that the two characters eventually bond, and bring out the virtues within one another. The child learns to be more appreciative and apologetic, while the ronin finds meaning in self sacrifice. The rest of the cast is equally simple, only the exact opposite of the two protagonists. They’re not malice embodied ala traditional Disney villains, but they do demonstrate the darker side of humanity: cowardice, ambition, blood thirst, greed, and several other character flaws. The heroism and purity of the protagonists are highlighted nicely next to the backdrop of immorality in the rest of the cast. The emphasis of these characters is the virtuous courage of our ronin hero; going against the world if need be to save an innocent child. The clash of heroic self sacrifice and greed inspired villainy gives the cast a bedtime story charm that is unhindered by simple and clear characterizations. The two main characters also avoid my two greatest peeves with one dimensional leads; their defining quirks aren’t obnoxiously exaggerated, and they prefer emotional understatement over melodrama. Instead of beating you over the head screaming “this is my unique personality!” or sulking and bawling at their own misfortunes, the two main characters retain a believable mildness that separates them from the droves of corny single-layer characters. You can, and ought to, leave your higher thought processes behind while watching Stranger. Its story piques our deepest, most primal sense of morality, and the action fuels our savage desire to watch violence unfold. If at any time you are too lazy to follow convoluted plots, too irritable to stomach pretentious lectures on philosophy, but you want to find release in heart pounding action sequences, then there is no title more elegant than Stranger that will satiate such a craving.